Opening Up: When an original wall separating the dining and living rooms proved unsalvable, Cindy and David took the opportunity to create a more open floor plan. In the kitchen, Engelke repurposed an antique porch column to provide necessary structural support. Most evenings, the Ellsworths can be found here, eating dinner or just hanging out at the quartz-topped island. Oscar, the couple’s Shih Tzu, strikes a pose in front of the powder room. 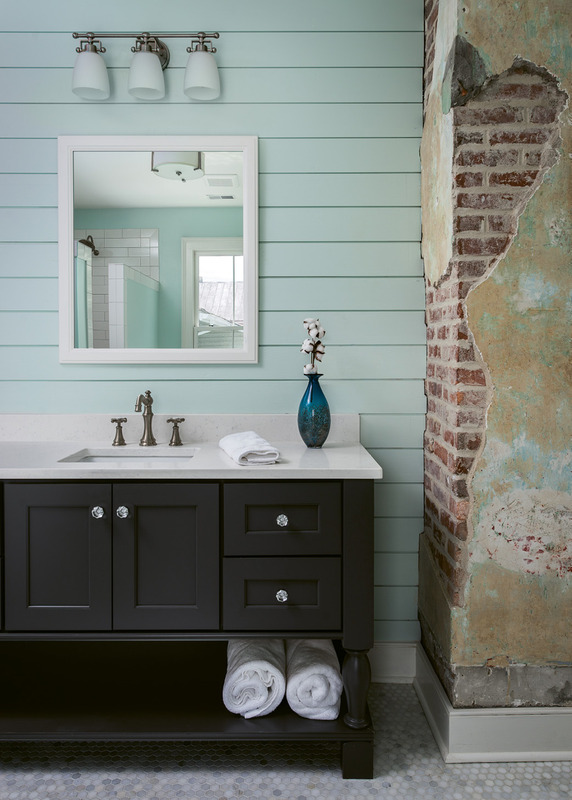 Though not original to the house, the half-bath adds some much-needed 21st-century convenience; beadboard salvaged from the back porch was repurposed as wall paneling, retaining a sense of the home’s history. The couple kept the decor minimal in order to highlight the architectural features, but the accessories they do have pack plenty of personality. After admiring the work of local artist Molly B. 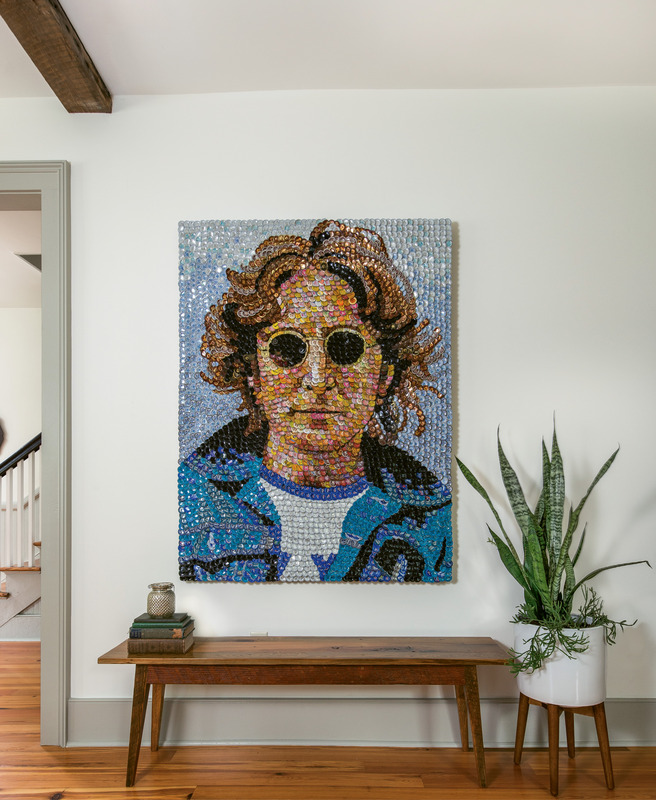 Right for many years, the Ellsworths commissioned this bottle-cap portrait of John Lennon, which hangs above a custom Landrum table in the living area. Cindy scored this striking statue, which she dubbed “Carmella,” while antiquing in Savannah. 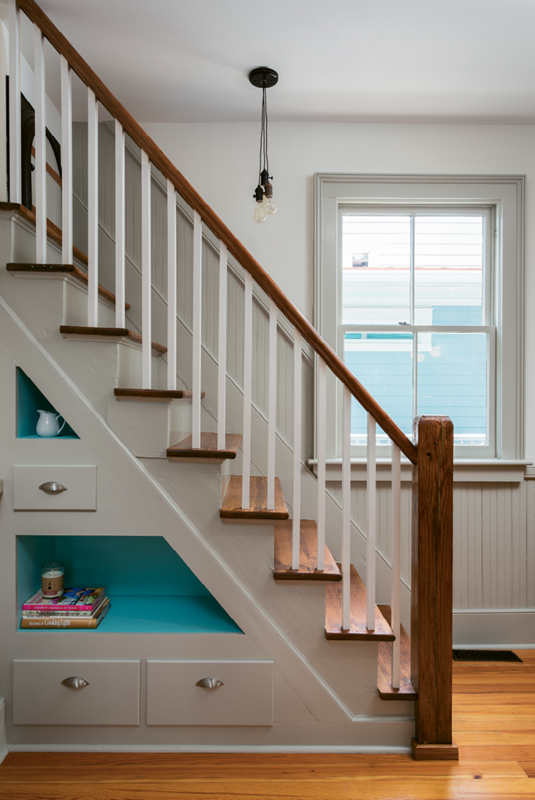 The former service stairs now function as an interesting focal point in the kitchen, as well as a fun play space for visiting grandchildren. 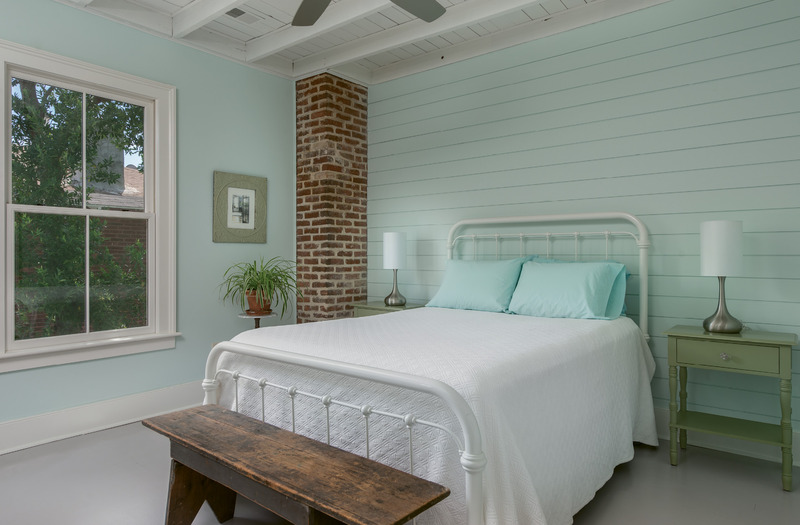 Shiplap walls in Behr’s “Whipped Mint” set a serene mood in the master bedroom. 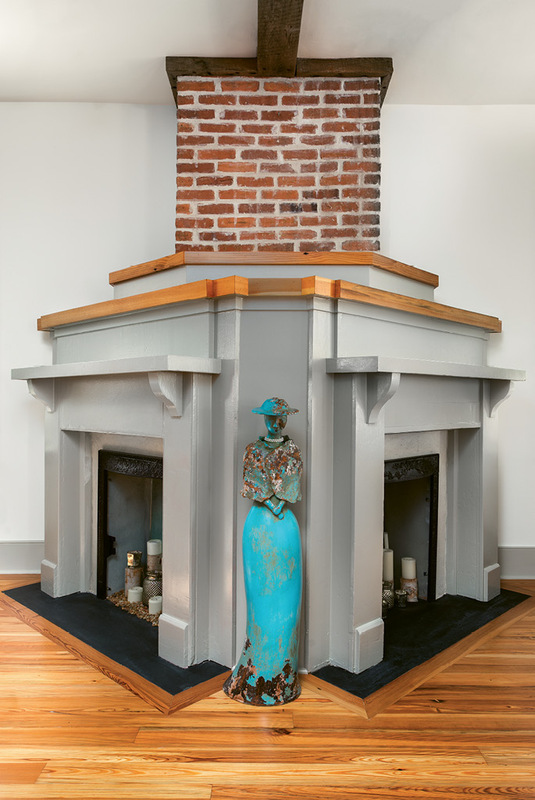 When Engelke’s crew had trouble removing all the plaster from the brick column in the master bath, Cindy decided to embrace it. She’s come to love the patina it adds to the space. 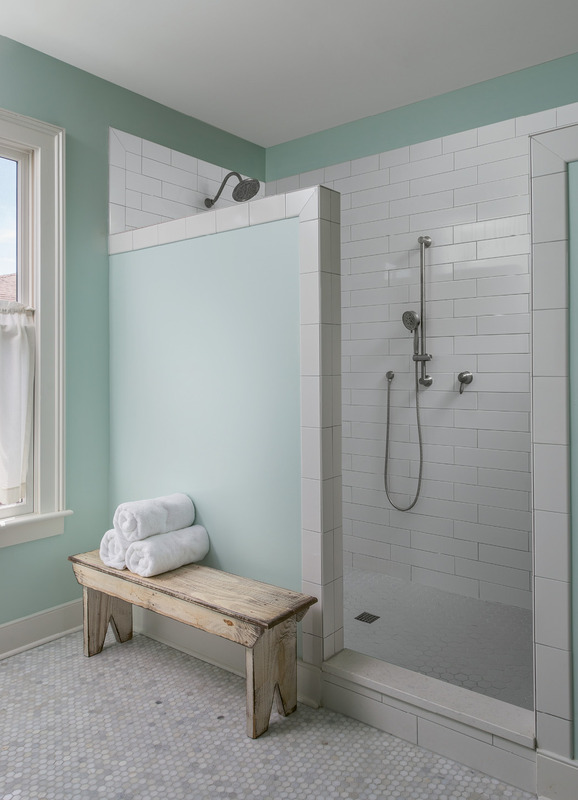 A tiled shower with no glass door makes the bath low-maintenance. “The design is a result of me hating to clean glass doors; I never wanted to see another squeegee again!” Cindy laughs. 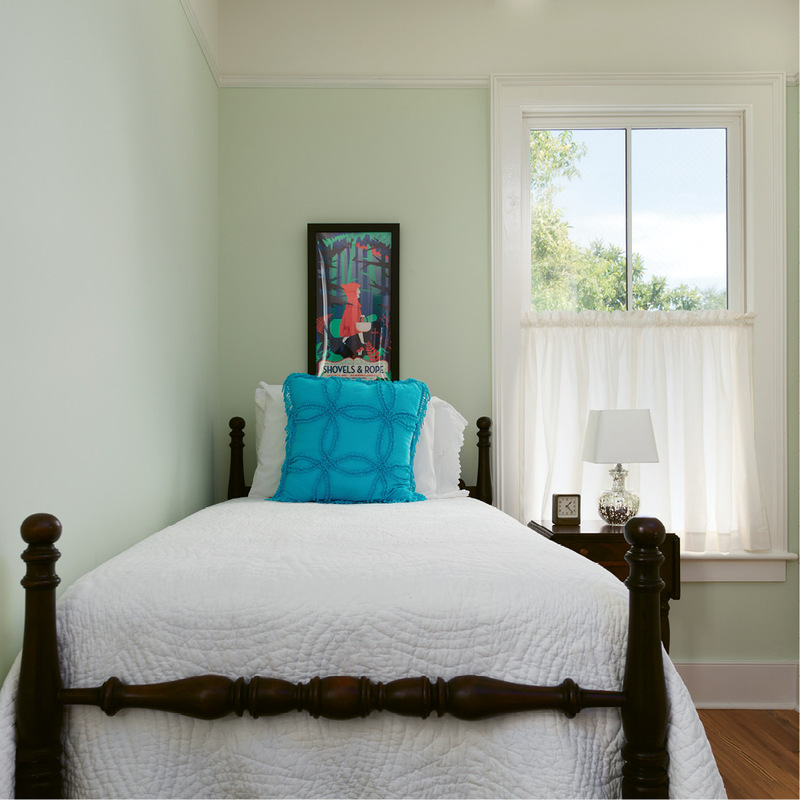 In this petite guest room, a vintage twin bed with a carved pineapple motif and a Shovels & Rope poster add local flavor. 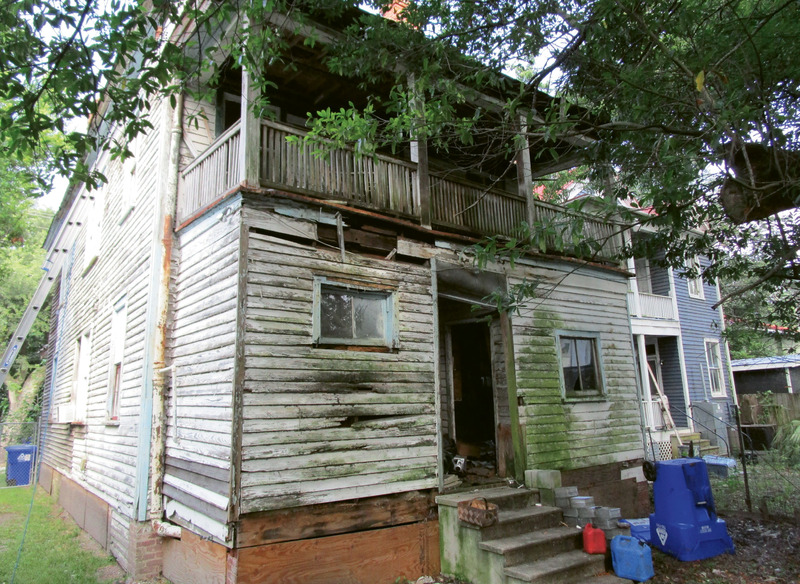 Before: During the renovation, the rotting back porch that had been closed in at some point was removed from the rear facade. A single-story screened-in porch was added to the footprint. The Ellsworths love entertaining, and their fire pit—which is topped with a slice of petrified wood when not in use—is the centerpiece of frequent backyard gatherings. 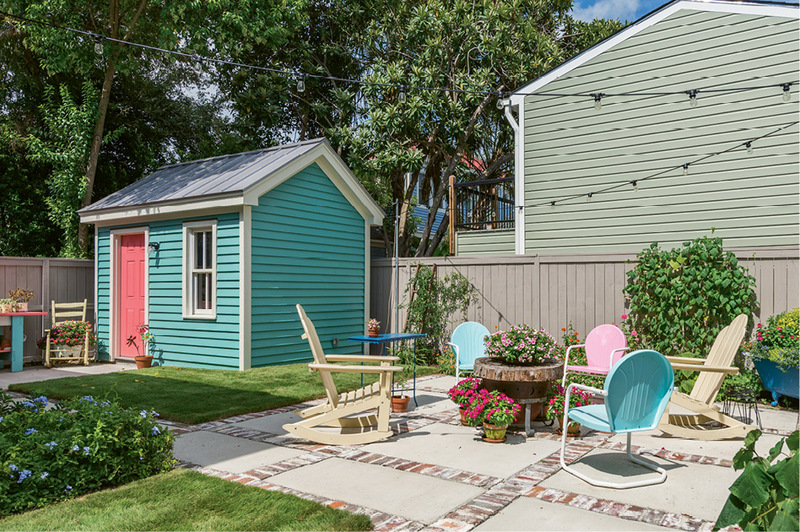 The coral door on the new gardening shed brings a fun dose of color to the scene. Cindy Ellsworth is the type of house romantic who believes old homes have souls. 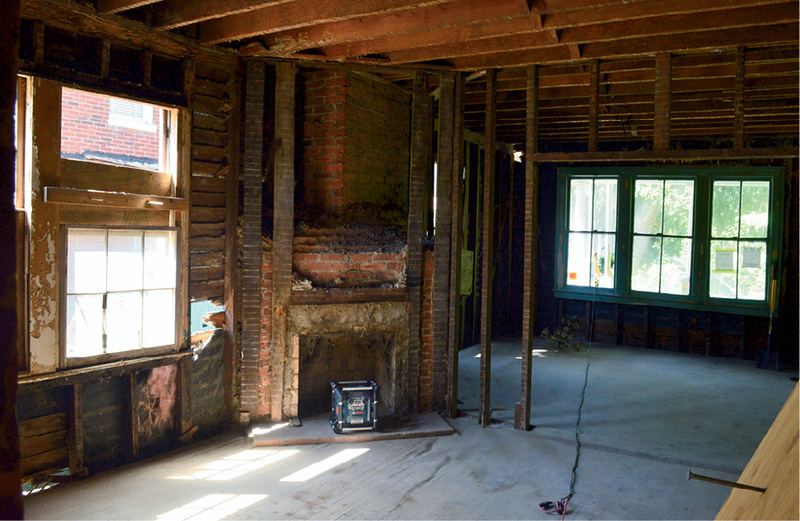 So when she and her husband, David, came across a dilapidated American foursquare on Sutherland Avenue, just a block off Hampton Park, she saw more than rotting beams and crumbling plaster. She saw a friend in need of repair. When they first laid eyes on the place, it was uninhabitable. With petrified rodents and animal bones strewn all over, the smell of decay, and other residues, permeated the floorboards and millwork so deeply that much of the building materials were unsalvable. But Cindy and David sensed a mysterious appeal in the home’s century-old frame. “I call her ‘Sutherly,’ and I like to say she’s a little spiritual,” Cindy says with a smile. 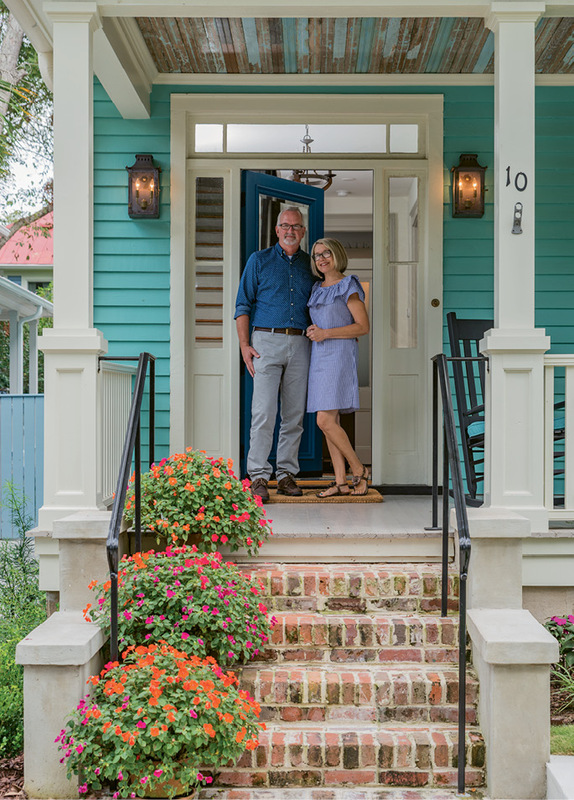 After an exhaustive three-year search for a place on the peninsula, they were up for the challenge of breathing new life into the circa-1915 abode. The affable couple moved from Ohio to the Lowcountry in 2006. 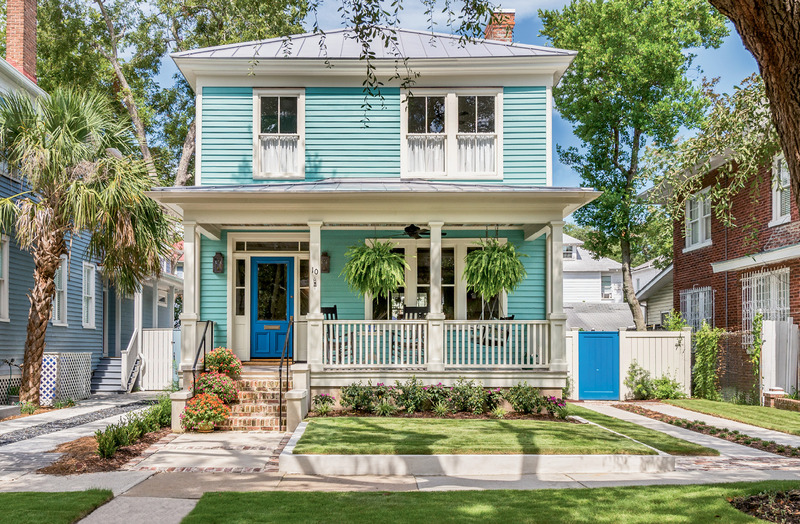 They built a custom home on Seabrook but found themselves increasingly drawn to downtown. “We love the diversity and energy the city provides,” David says. For seven years, they helmed Carolina Coaster Company, and Saturday mornings found them selling their wares from a booth at the farmers market in Marion Square. (The pair shuttered the business last year, opting to retire and spend time soaking up their new neighborhood.) “We like to go to concerts and eat out often, so we were spending a lot of time driving back and forth from Seabrook,” Cindy notes. And while moving to Charleston proper made sense, finding a downtown address proved difficult. They set their sights on Hampton Park Terrace, which wooed them with its friendly neighborhood vibe. Plus, the park itself offered a plethora of picnicking spots (“we are known for our picnics,” Cindy notes), and a slew of new restaurants had popped up within walking distance. But as their search stretched on, other buyers snapped up house after house before the properties ever officially hit the market. 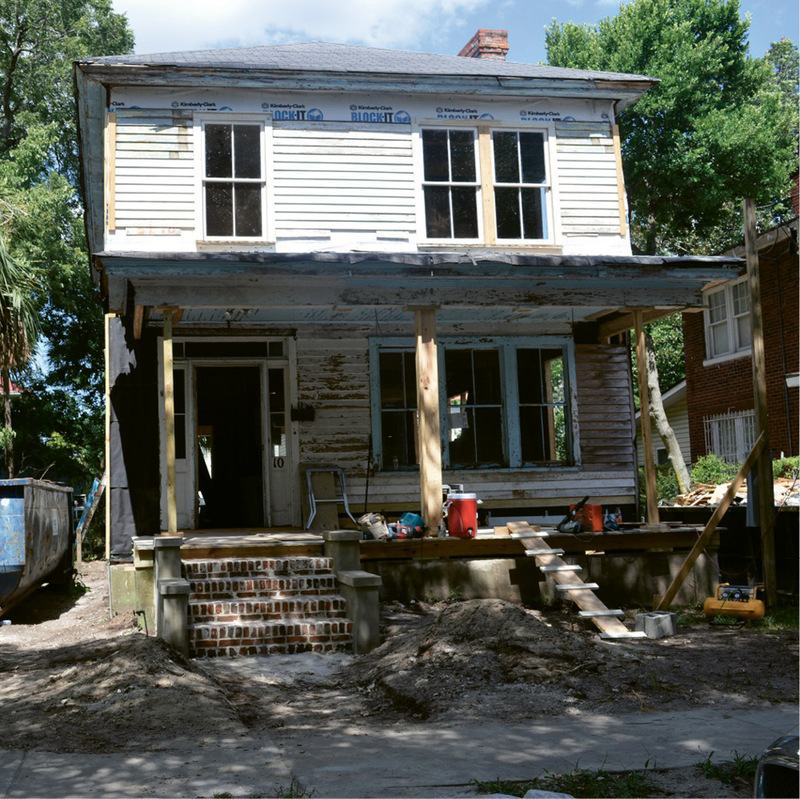 When Cindy and David learned that an area developer had bought the decaying structure on Sutherland Avenue with plans to flip it, they offered to buy it outright so they could flip it for themselves, then tapped Marc Engelke of Engelke Homes to oversee the project. 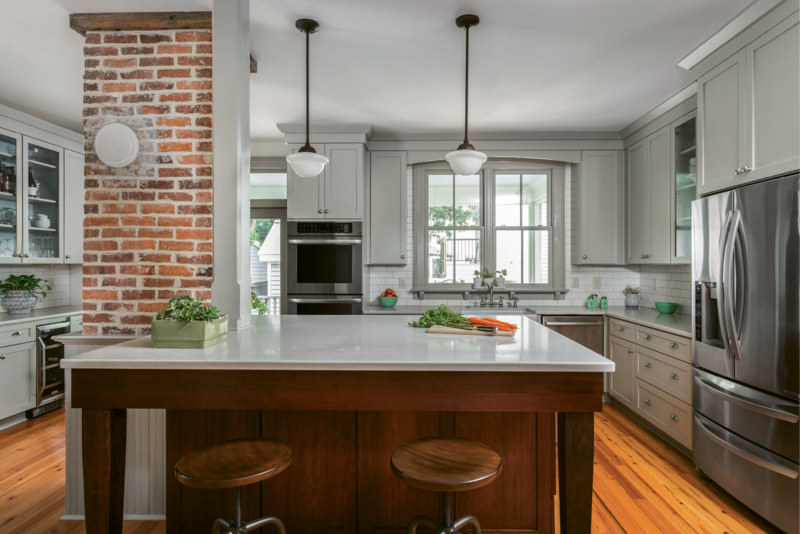 A contractor specializing in historic renovations, Engelke’s respectful approach to vintage homes has won him numerous Preservation Society of Charleston Carolopolis Awards. Cindy was sure that “Sutherly” was in good hands. 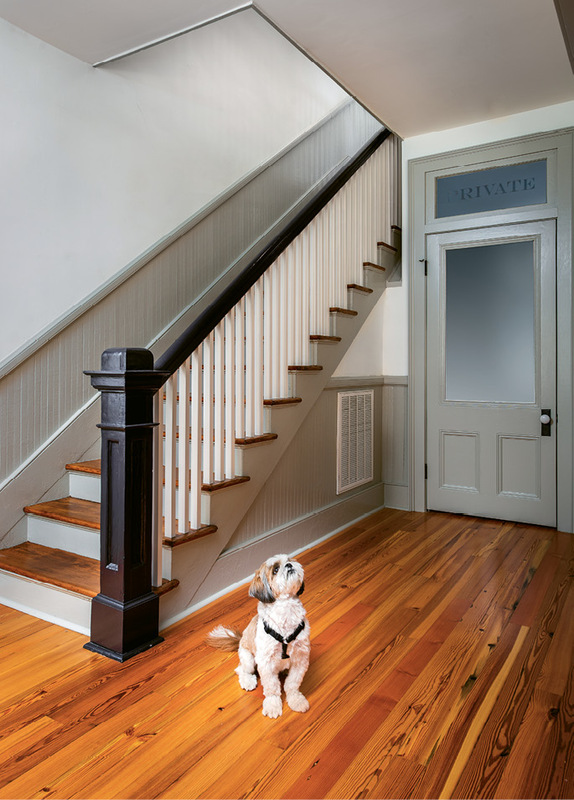 Under his guidance, they embarked on a preservation-minded renovation—no small task given the home’s condition. “We saved as much as we could,” Cindy notes. 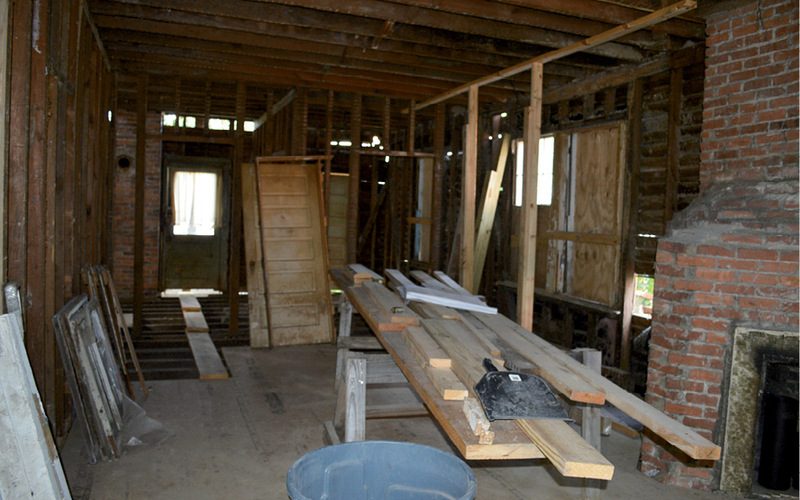 But much was beyond repair, including most of the oak and heart-pine floorboards. “Marc did everything he could to save them,” she adds. “He even pulled the wood up, took it outside, and left it in the rain and sun, hoping that might help. But the smell had just permeated it all.” Heart pine salvaged from another Engelke project made for a reasonable substitute. There was a silver lining to the severity of the damage: as many of the materials needed to be completely replaced, the Ellsworths were able to free up the first-floor layout. “We wouldn’t have had the heart to tear away history just to make it modern,” Cindy says. This paved the way for an open floor plan that flows from the dining area to the living room to the kitchen. 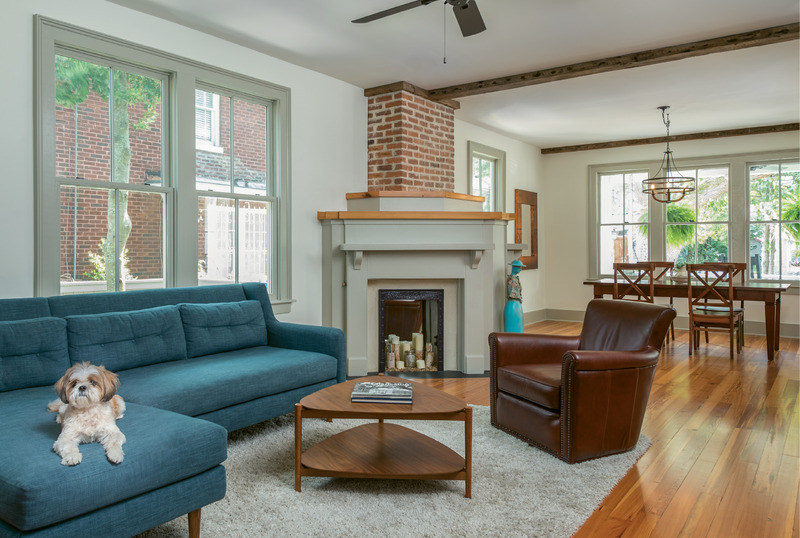 A fireplace with exposed original brickwork keeps the space grounded in its 102-year-old history, while a new powder room situated under the front staircase brings a dose of 21st-century convenience. 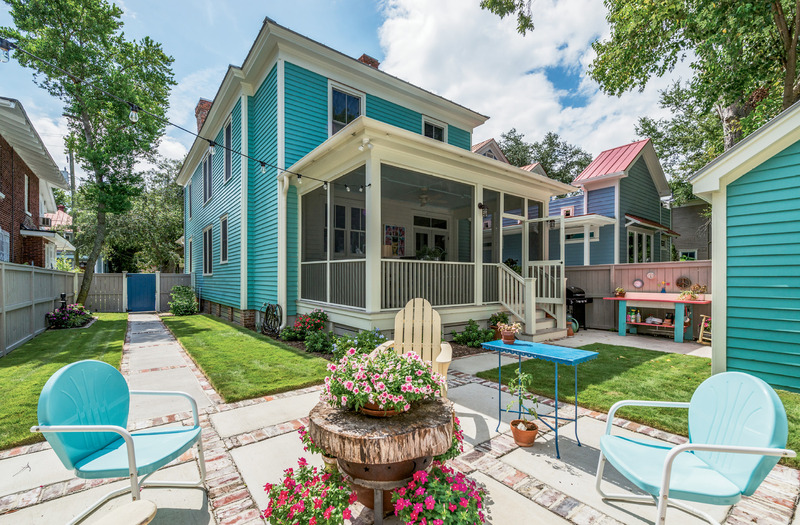 Other materials were recycled in unexpected ways: beadboard was taken from the former back porch and relocated to the front-porch ceiling and powder-room walls. Mostly unfinished, the worn wood panels lend an interesting patina to the freshly renovated space—something Engelke is particularly proud of. 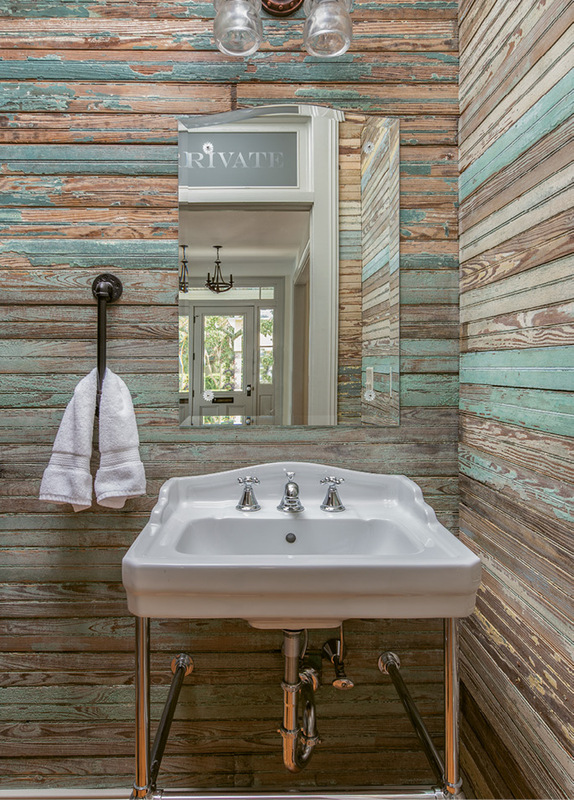 “Showing layers of old paint helps to tell a piece of the story of every family that has lived in the house,” he says. With the home fully restored, the Ellsworths were thrilled to move in—but as the van was being unpacked, Cindy had an epiphany. “When they started bringing all the stuff in, we realized that we wanted to be as minimal as possible so all the architectural features would be highlighted,” she says. The couple did away with many of their old furnishings and bought new pieces with a smaller scale. “The house in Seabrook was more cottagey,” Cindy says. “But a mid-century sofa, for example, has a lower profile that doesn’t overpower.” A few special works of art, including a bottle-cap portrait of John Lennon by artist Molly B. Right, provided the finishing touches.